The Veneto region is known worldwide for its fascinating culture and history and its picturesque natural setting, making it the most visited among Italian regions. It is also one of the most prosperous. Though now quite industrialized, it is still probably the most romantic region of Italy. Most of the landscape may seem rather flat, but there are some lovely areas in the foothills of the Alps and beautiful vineyards. Its cities are indisputably beautiful and filled with masterpieces of art and architecture. Its fascinating capital on the lagoon, the unique city of Venice, is of course the city most renowned for its charms, but Verona, the well-preserved fabled home of Romeo and Juliet, is also found here. 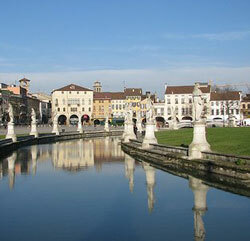 There are also other historic towns with wonderful architecture and artistry, like Padua and Vincenza. Along the Brenta River are summer villas built by wealthy Venetians of the Renaissance as summer retreats. And there are some interesting towns in the islands in the lagoon. Tourism, however, is overwhelmingly centreed upon the historic regional capital. Most of the population is also concentrated upon it, along with Padua and Verona. This region has its problems, of course. It is terribly hot and humid in the summer here. It is very pleasant in springtime, but can get rainy. There is a great deal of rain in winter and there has even been, on rare occasions, light snowfall. Despite being along the coastline, Veneto is not really known for its beaches; they are decent but not spectacular. La Serenissima - the Serene Republic of Venice - a city of glorious art and architecture and a long, fascinating history, it is acknowledged as one of the most beautiful cities in the world. Having barely changed over the last 600 years, Venice is a dreamlike place filled with medieval and Renaissance-era palaces unmarred by modern buildings and automobiles. Venice is spread out over 117 little islands, with hundreds of bridges crisscrossing the famous canals. While it's not a large city - you can walk from one end to the other in about an hour - Venice has the feel of an extensive and intricate maze of narrow streets, canals, and bridges. Cars and bikes of any kind are barred from venturing on its cobblestoned roads. This is a city made for walking - or travel on the canals, which are the city's major thoroughfares. Looking past the famous gondolas, Venice has faster and more utilitarian modes of transport in the vaporetti (water buses) and water taxis plying its canals. These can take you as far as some of the outlying islands. The city of Venice itself is already a sight to behold, but like a puzzle box it reveals more treasures at every turn. Not to be missed is the stunning St. Mark's Cathedral and its famous square, or the impressive Palazzo Ducale with its atmospheric Bridge of Sighs. Renaissance and Baroque masterpieces are cached within various churches and museums, and an impressive modern art collection is housed in Peggy Guggenheim's former villa. Venice meticulously preserves its heritage; the city is a UNESCO World Heritage Site, and it has strict laws prohibiting alterations to its historic buildings - which can be a bit of a headache for local landlords. But it has become a city primarily for tourists; the native Venetians have largely emigrated in large numbers. (In 1965 it was a city of 150,000 but as of 2005 its inhabitants number a little more than 80,000.) Those who stay have to deal with the high cost of living; because of its popularity as a travel destination, Venice's facilities are geared to serving tourists and tend to be expensive. The canals that give Venice its beauty and character also cause a few problems. They can get a bit smelly in the summer and they can flood during torrential winter rains. Despite these drawbacks, homes overlooking the canals are in demand, especially along the Grand Canal. The area by the Rialto Bridge is an excellent location to find an apartment with a view of the Grand Canal. Venice offers little by way of entertainment other than explorations of cultural treasures and frequent classical concerts. There is also a theatre scene, but as you might expect, the performances are in Italian. The city is fairly quiet at night except during the vibrant Carnevale, when Piazza San Marco overflows with festivities. Venice is divided into six districts, known as sestieri. These are Cannaregio, San Polo, Dorsoduro, Santa Croce, San Marco and Castello. The Cannaregio and Santa Croce areas are residential with less bustle than the rest of Venice. The second-largest sestiere, Cannaregio is the northernmost district of Venice and the location of the old Jewish Ghetto. "Il Ghetto" was named for the abandoned 14th-century iron foundry that occupied the area before the Venetian authorities forced the city's Jews to move in. The word "ghetto" subsequently became a common term for neighbourhoods in which persecuted minorities are segregated. The Venetian Ghetto existed from 1516 until 1797, when Napoleon took the city and gave the Jews the freedom to live anywhere in it. However, the ghetto area remains central to Venetian Jewish life to this day. Cannaregio is one of the last parts of the city to have native Venetians still resident in large numbers. It is a relatively quiet district, less touristy than other parts of Venice, though it has a few shopping areas that do attract some crowds. Though Cannaregio is where many tourists first set foot in Venice after arriving at the Santa Lucia railway station, most visitors go straight over the first bridge and then take the Rialto, hardly spending any time in the district. Castello is the largest of the city's siestieri, occupying the easternmost part - the "tail" of fish-shaped Venice. It originated as a shipyard known as the Arsenale, back when Venice was the foremost navy centre of the Adriatic Sea. Today, the former naval dock is an elegant Byzantine-style enclave surrounded by high walls. With its picturesque square towers and lovely Renaissance gateway guarded by four Grecian lions, the Arsenale evokes a bit of fairytale charm in an otherwise derelict and formerly industrial neighbourhood. The northern and western parts of Castello are quite different from the Arsenale area; these parts include places much frequented by tourists, particularly the area connecting to Piazza San Marco over the Bridge of Sighs. That is the area containing the stately Chiesa di San Zaccaria, an elegant Romanesque and Renaissance church. Several blocks north of San Zaccaria is Campo Santi Giovanni e Paolo, a magnificent square that is home to Santi Giovanni e Paolo church and the Scuola Grande di San Marco. Close to it is another attractive square, Campo Santa Maria Formosa, named for its Renaissance-style church. The paved square is a pleasant place where you can enjoy a drink at a bar or browse in an old-fashioned tobacco shop. Canals with waiting gondoliers border two sides of the square. The other sides are lined with lovely palazzi, including Palazzo Querini-Stampaglia, a Renaissance manor that houses an exquisite art collection and a library of antique works. Northern Castello is a graceful neighbourhood with attractive apartments - not a bad choice for the expat enamored with Venice and seeking to stay. Campo Santa Maria Formosa and its surrounding streets make for an excellent, centrally-located living area. Another good place to stay, Via Garibaldi, is one of Castello's liveliest streets, filled with cafes and osterie - traditional Italian wine taverns - and steeped in quintessentially Venetian character. Dorsoduro is a lively part of Venice with good nightlife and dining. It is also known for the arts, as the Accademia Gallery and the Guggenheim Museum are located here along with Ca 'Rezzonico, a palazzo that now houses a museum of 18th-century Venice. The Mendigola parish of Dorsoduro was one of the earliest parts of Venice to be colonized, long before the Rialto area became developed. Founded by fishermen, the parish retains a working-class vibe, with faded old apartment buildings arrayed around communal courtyards. Dorsoduro is known as the university district of Venice; at the heart of it stands the Universita' Ca' Foscari Di Venezia. Many students live in the area surrounding the university, and there are many stores and bars catering to the student crowd. The more attractive residential areas in Dorsoduro can be found south of the main square, Campo Santa Margherita. This square is a lively and popular meeting spot, with a lot of bars, restaurants, and pizzerias. Another attractive area with many shops and cafes is the Zattere promenade along the Giudecca Canal. The Island of Giudecca is part of the Dorsoduro district. It used to be an industrial and working-class area, but the factories have long closed and today it is a tranquil residential neighborhood that retains a strong local flavor. It also offers spectacular views of Venice across the Giudecca Canal. San Marco is the busiest of the city's siestieri, and is not just the district most frequented by tourists but also the political and religious heart of Venice. Piazza San Marco, the gorgeous centrepiece of the city, exemplifies what this sestiere has to offer: ornate historic buildings, traditional Italian outdoor cafes, and galleries of beautiful paintings. The marvelous Byzantine cathedral that adorns the famous square, St. Mark's Basilica, was built in the 11th century and clearly shows Eastern influences in its design. Beside the cathedral stands the Doge's Palace, once the seat of the ruling duke of Venice. The palace exhibits masterful artworks by Tintoretto and Veronese, and includes the world-famous Bridge of Sighs. More great art can be found in the Correr Museum just across the square. In the centre of the piazza stands the Campanile di San Marco, an imposing bell tower capped with a golden angel. San Marco was historically the area preferred by the high-class gentry of Venice, whose stately residences flank the Grand Canal alongside buildings such as the Spanish Embassy, the Austrian Embassy, the Teatro Goldoni, La Fenice opera house, and the Ridotto - a former gambling house where masked aristocrats gathered to wager fortunes away. Today, the Ridotto is the salon of Hotel Monaco, where the casino atmosphere is revived during Carnevale festivities. Some of the city's most elegant streets are found in San Marco; these include Oxford Street and the Merceria, the city's main shopping thoroughfare. Consisting of Mercerie dell'Orologio, Merceria di San Zulian and Merceria di San Salvatore, the Merceria winds its way from the Rialto to Piazza San Marco through a network of narrow alleyways lined with rosticceria and small boutiques selling designer fashions, textiles, leather goods, and glassware. A more upscale shopping street, Calle Larga XXII Marzo, glitters with luxury clothing stores and gift shops. Fresh food markets, however, are not really known in San Marco; but at the nearby Rialto area there is a large market for vegetables and fish. This tiny district in the centre of Venice is a lively commercial area packed with lovely small shops, food stalls, cafes, bars, and osterie right along the Grand Canal. Its streets tend to be named after what is sold on them, thus: Casaria (cheese), Erberia (vegetables), Naranzeria (oranges), and Speziali (spices). The streets form a labyrinthine tangle of tight alleyways leading into paved squares like the spacious Campo San Polo, from which the sestiere took its name. Several popular attractions, such as the Frari Monastery, the church of San Giacometto and the Scuola Grande di San Rocco, keep drawing the tourist crowds. Venetians, on the other hand, flock to the marketplace by the Rialto Bridge, where there is a large pescheria (fish market). San Polo is one of the oldest parts of Venice, and probably the most medieval in character. It is a colorful and convenient place to stay in, with one drawback - it can get awfully crowded at the height of the tourist season. If that sounds like it could be a problem, you may be better off staying at the neighbouring sestiere of Santa Croce. Santa Croce is one of the districts least frequented by tourists, unless they're coming in or going out at the Piazzale Roma, the city's bus depot and carpark area - and the only part of Venice where cars are allowed to go. The Piazzale Roma area is a busy place, but much of Santa Croce is actually quite tranquil and steeped in old-fashioned charm. Its Campo San Giacomo dell' Orio is a welcoming little square that is often lively at night with music and dancing. There's a market on the square, and more shops along the Rialto, just a short distance away. The eastern part of the district is largely medieval in character. With its lack of tourist sights, Santa Croce has a more authentic neighbourhood feel than most parts of Venice, and its shops and restaurants are less expensive.